I met a lot of people during the course of the recent 24 hour holiday photo shoot. I was able to introduce some of them in the photo-essay but wasn’t able to share very much and no more than one image. I thought it might be nice to share some more details about some of those folks and to let you see some photos. This is the tailor Zhou Shulin. Zhou is 59 and has a small, cluttered shop in the alley just behind my apartment building. I’d not officially met him before last week but I would often see him in the window of his shop as early as 6:30 when I left for school. He had always been cordial, waving or nodding and saying good morning whenever he noticed me, so I thought he might be amenable to having a chat and letting me take some photos. He was more than amenable and this first encounter set the tone for the day. 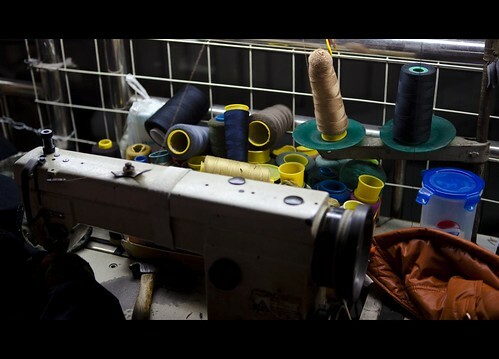 Zhou has been a tailor for more than 40 years. He doesn’t actually make new clothing but anything you need done in the way of alterations or repairs he can do. Below is the image I shared in the photo essay. 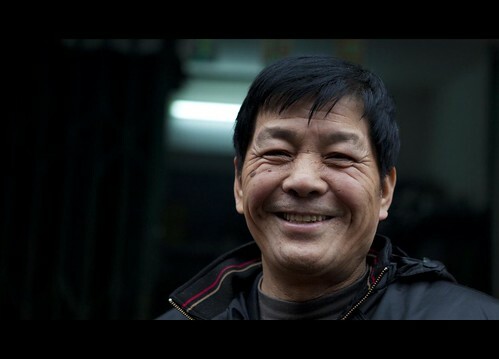 Zhou has an easy smile but his gnarled, calloused knuckles can’t hide the years spent scraping across the fabric of time. To me, everything in Zhao’s shop looked unorganized and frankly a bit dirty, oily even. I think dark clothing is probably a safe bet but I would be hesitant to bring my summer whites in! Some of Zhao’s tools. 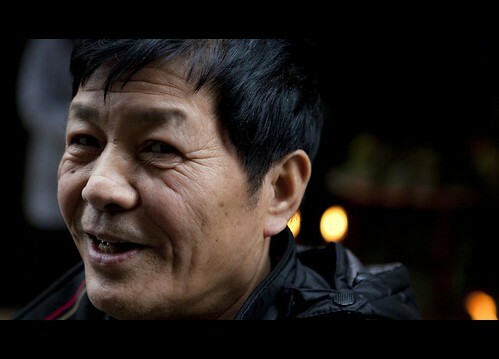 By living on a strict budget, Zhao and his wife have their own home and he was able to send his son to a first tier college in Nanning. Now 35, his son is a mid-level manager at the water company. As we were leaving, Zhou held out his hand and offered an open invitation to stop in whenever I liked. He said he always has good tea. I’ll be back. You might remember it was cold that morning, and a little wet. You can see the mist on Zhou’s head and his neighbor’s fire on the street across the alley. Over the next few weeks, I’ll introduce you to more of the people I spent time with during the photo shoot. I’ve been working on a project detailing the home-buying process here in China. It’s been an eye-opening experience. I’ve gotten a first-hand look at some of the seedier aspects of China’s real estate industry and the frustration felt by an average citizen trying to purchase their dream home. The websites are coming around, I hope to roll out at least a beta with in a few weeks. Keep reading, as soon I’ll give details on how you can win a copy of my book “Saving Face – A Portrait Collection”, as well as limited edition signed and numbered prints. I’ll be offering these in conjunction with the launch of the new website. ~ by Expatriate Games on February 20, 2010. Looking forward to the book and the websites. And more great images. Keep up the good work. Thanks Craig, really enjoying your photo-tips ebook. Nice to have the collection in one place. When is the next volume going to be ready? Final touches will go on it this week and it’ll be released to my mailing list next weekend and everyone else a couple of days later. I have a few questions, how do you remember their names? I find myself i can remember pictures of places i took of maybe 2 years ago and even remember the “memories” of a certain place but i’m bad at names, do you bring a recorder? A notepad perhaps? I’m just curious, you meet a LOT of people but you still manage to remember their names and details. 🙂 Thanks! Of course we took notes! It depends on the situation and what it is I’m trying to do. For this project, Jia took notes during the first 12 hours. If I am out by myself just shooting, I don’t always stop to get the details or even a name. On my photo walk with Jeremy last week I took no notes at all and asked very few questions. Now, I regret not getting the details of the Xinjiang man who was selling lamb kebabs in Yu Feng park. If i find myself in a comfortable environment I’ll jot down a name or some details but I usually find people clam up when I pull out the notepad. On the other hand, if I know I’m going to be shooting for a particular project or story, I usually have help help, both with translation and remembering the details. The translator is better able to explain the concept of what I’m trying to do and that makes folks feel more comfortable. It doesn’t always work of course. During the 24 hour shoot I would say about a third of the people I shot wouldn’t give us any personal information. If the details are important, better take notes. Sometimes an image can speak for itself but often I look at a photo and want to know the back-story. .
Yeah, I think the process is different depending on what your trying to accomplish. I mean, if all your doing is out to shoot some photos, leave it to the viewer to figure out what is happening. Sometimes that works, sometimes it doesn’t. You certainly are never going to get the same response from everyone. You need to feel you way through the conversation and watch how people are reacting.